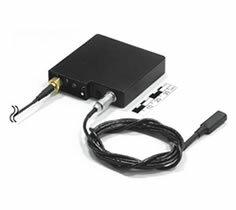 A digital audio transmitter, used for transmission of audio intelligence via radio channel. The digital encryption on the radio channel eliminates any risk of interception. The conversion from analog to digital is based on the adaptive-delta modulation (ADM) principle. The product comes as a tough metal case, with built-in power supply compartment, power switch, external microphone (70 cm) and flexible external antenna. Its high output power guarantees a clear reception even in heavy radio environment. The transmitted signal can be received with a special receiver or a modified scanning receiver with decoder. The digital encryption prevents any possible radio interception. In fact, the received signal has no voice attributes, and any intercepting device would only hear it as a constant noise. The product is especially suitable for portable applications, and the package includes a special protective cover for body worn applications.